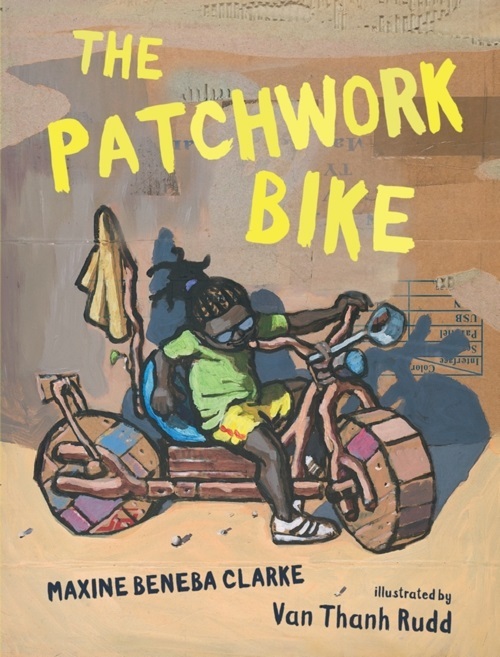 I’ve a bit of art today from Maxine Beneba Clarke’s The Patchwork Bike (Candlewick, September 2018), illustrated by Van Thanh Rudd. First published in Australia and New Zealand in 2016, this is the story of a young girl, her “crazy brothers,” their “fed-up mum,” and their desert “mud-for-walls” home in a third-world country. The “best thing of all in our village,” the girl tells us, “is me and my brothers’ bike.” It is, as the title says, a patchwork bike made of spare parts — tin-can handles, wood-cut wheels, branches for handlebars, and the like. Rudd illustrates this story via acrylics on cardboard in spacious, uncluttered spreads. (We can often see the markings of the cardboard boxes — arrows, numbers, tape, etc. 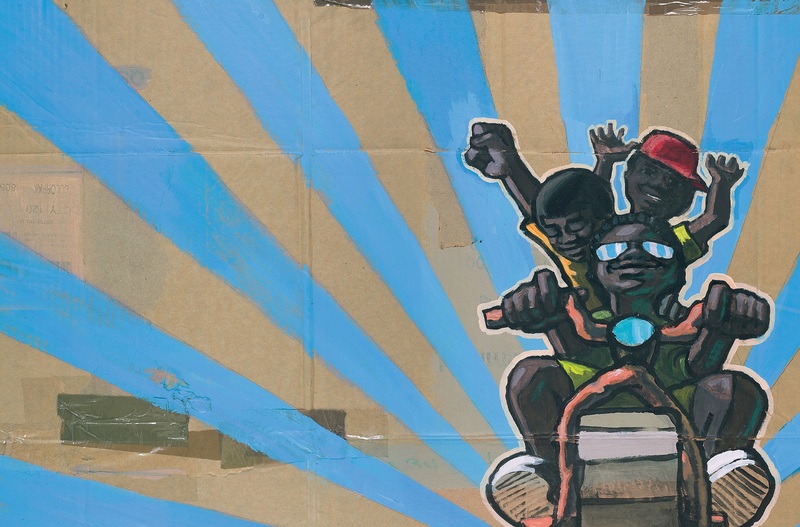 The art note on the copyright page indicates this is recycled cardboard, which is important, given that the characters in the book used recycled parts to create this bike they so enjoy.) Rudd captures textures and shadows with great effect. 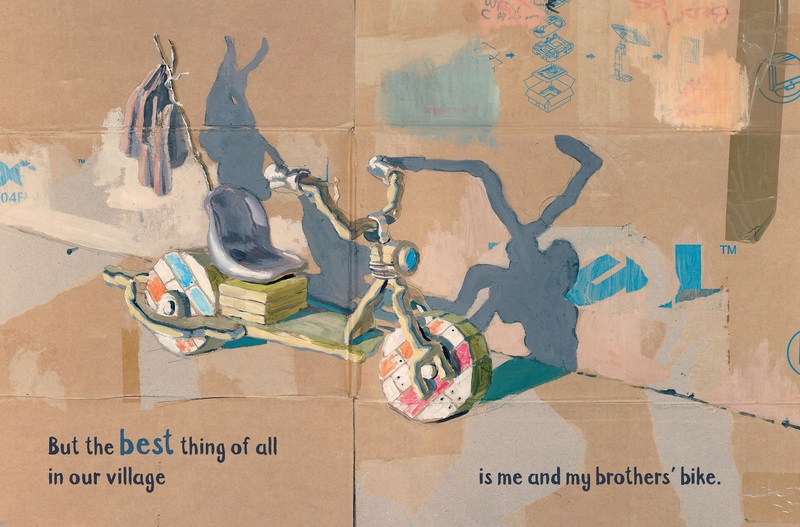 His depictions of the siblings zooming by on their bike are kinetic wonders. As if we’re seeing it from the mother’s perspective, we see a blurry wall of motion in shades of blues and reds. The kids, while on the bike, are untouchable, and Rudd’s streaks of acrylic paints in these moments make that clear. THE PATCHWORK BIKE. Text copyright © 2016 by Maxine Beneba Clarke. Illustrations copyright © 2016 by Van Thanh Rudd. Illustrations reproduced by permission of the publisher, Candlewick Press, Somerville, MA. I’m going to keep it short this week so that I can get back to my long weekend. My kicks, one to seven, are time spent with friends this weekend and time with the family. I hope to actually take the day off tomorrow. Hey, fly by today half way through my adventures on the road. I like the idea of a patchwork bike. Good afternoon, Imps! Happy September, everyone! Hello, Van Thanh Rudd! I am digging the use of the recycled cardboard. That’s awesome. Jules: Enjoy the time with your friends and family. You should definitely get a day off! I really love this story, these energetic illustrations, and the recycled cardboard for the illustrations. Jules – enjoy your day off! Jone – enjoy your travel adventures! LW – Really love kicks 1, 3, 6 & 7 today. 1) Saw an incredibly beautiful sunset after a very long day. 2) Serena Williams playing and slaying in her black tutu at the US Open. She is the GOAT. 3) Women running for office and winning their primaries. Girl power for the win. 5) My legendary good luck pulling through again – car battery died only 1 block from Jiffy Lube so super easy and quick fix. Yay! 6) Finished the last book in the #TATBILB series by Jenny Han, “Always and Forever, Lara Jean.” Sure hope Netflix makes movies of the whole series. 7) Iliza Schlesinger comedy specials. Feminist and funny, funny, funny. 7.5) Daisy being her sweet adorable self, as always. Have a great long weekend Imps! Jone, have fun on your adventures! LW: That sounds like a very balanced week. Rachel: Thanks for the comedy recommendation! I’m glad for your legendary good luck, and I had to look up what “GOAT” meant. Now I’m in the know. I hope you are all having a good long weekend (and that it’s actually a long weekend for each of you).